The critical 19th century Tubingen school questioned whether or not Paul wrote this letter. F.C. Baur (a critical scholar from Tubingen) argued that this was a second century letter that was spuriously written under Paul’s name to address the issue of slavery in the church. Other critics noted the similarity with Colossians in regard to the final greetings, which led some to think that this was purposely copied from Colossians. If Paul wrote this letter at the same time as Colossians, then this would date the letter sometime between AD 58 and 60. Both letters mention “Archippus” (Phile. 2; Col. 4:17), and they both contain the same closing greetings. However, in this letter (Phile. 22), Paul asks Philemon to prepare lodging for him. This implies that he was ready to leave house arrest and come visit him (see “Introduction to Colossians”). This book is a short, personal letter between Paul and a slave-owner named Philemon (pronounced fie-LEE-mun). In the letter, Paul is urging Philemon to take back a thieving slave named Onesimus (oh-NISS-i-muss). It is interesting to see the way Paul motivates Philemon to do this. Paul spends the first nine verses acknowledging Philemon’s Christian maturity and love. He calls Philemon his “beloved brother” (v.1), and he tells him that he prays for him often (v.4). He acknowledges his love for Christ and “all the saints” (v.5). By saying that Philemon loves all the saints, this would inadvertently include Onesimus, as well. Paul could already be setting up for the call that he is going to make in verse 10. Paul also tells Philemon how much his friendship means to him personally (v.7). At this point, he tells him that he could boss him around or command him to do what is right (v.8-9). Instead, he “appeals” to him. Paul’s persuasion and rhetorical skills must have been phenomenal. We can all learn from the way that Paul motivates and persuades Philemon to make this decision to accept Onesimus. Paul’s strategy can be summarized in verse 14: “I wanted you to help because you were willing, not because you were forced” (NLT). Paul deeply loved (agapetos) Philemon (v.1b). In the letter, we learn that Philemon is a mature Christian (v.5), and Paul probably personally led him to Christ (v.19b). Philemon is a slave owner (v.16), and there is good evidence from the letter that he is wealthy. For one, he has a “guest room” (v.22) in his house, which implies wealth. Philemon also has a house church (v.2), and he owns slaves (e.g. Onesimus). Moreover, you can see that Paul refers to him deferentially in this letter, which implies that Philemon was from the upper-class. This would not be unusual in the ancient world. Many slaves risked the wrath of their owners (backed up by stringent laws) in the attempt to escape. At this point Onesimus could have joined a band of other ex-slaves, hidden himself in the underworld of a big city, or fled for refuge to a pagan shrine. Instead, whether by design or sheer providence, he had met Paul. And he had become a Christian. Onesimus’s status was the lowest that one could reach in the ancient world. Because he was a runaway slave, he was protected by no laws and he was subject to all manner of abuse. Fugitive slaves usually went to large cities, remote parts of the Roman state, or into unsettled areas. At this time, their capture and return was largely an informal arrangement between the owner and a provincial administrator. They were frequently beaten unmercifully or put to tasks in which their life expectancy was very short. At this point, Paul most likely sent Onesimus back to Philemon (v.12), but he didn’t want to return him blindly. Paul promised to reimburse Philemon for any debt Onesimus owed to him (v.18). It’s one thing to preach about how there is “neither slave nor free” (Gal. 3:28), but it’s quite another to put it to the test by sending Onesimus back to find reconciliation. Because Ignatius refers to Philemon as the Bishop of Ephesus (AD 115), we should assume a happy ending for the conflict. Ignatius called Onesimus a man of “inexpressible love” and as “an excellent bishop” (Letter to the Ephesians, 1.3). Jefford writes, “Scholars have speculated that Onesimus, mentioned by Ignatius as the bishop of Ephesus in Ephesians 1.3, was in fact the same slave about whom the apostle Paul wrote in his letter to Philemon in the New Testament… there is no way to confirm that the references are to be associated with the same person. Nevertheless, this connection circulated widely within early Christian tradition and may in fact reflect some ancient foundation.” Onesimus must have treasured this letter, reading and spreading it around to others. Why is this short book in the Bible? In these 25 verses, Paul doesn’t pull any punches. He uses every possible angle to get Philemon to release Onesimus. Yet he stops one step short of merely ordering Philemon to do so. (1:1) “Paul, a prisoner of Christ Jesus, and Timothy our brother, to Philemon our beloved brother and fellow worker.” Paul never opens up a letter by identifying himself as a prisoner. He always identifies himself as an apostle. Why do you think he might do this here? He likely does this to identify himself with Onesimus—the slave. (1:3) “Grace to you and peace from God our Father and the Lord Jesus Christ.” Paul reminds Philemon of God’s grace to him. 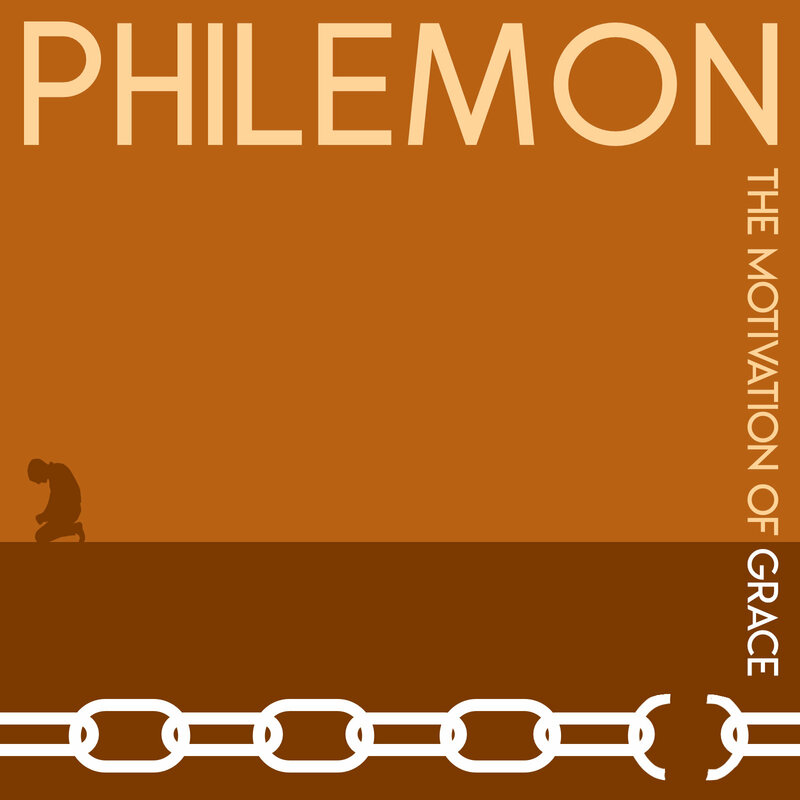 Will Philemon show grace to Onesimus? (1:4) “I thank my God always, making mention of you in my prayers.” Paul reminds Philemon that he loves him and prays for him. He makes his appeal as a loving friend and leader in his life. (1:5) “Because I hear of your love and of the faith which you have toward the Lord Jesus and toward all the saints.” If Philemon loved “all” the saints, then he should love Onesimus too. (1:6) “And I pray that the fellowship of your faith may become effective through the knowledge of every good thing which is in you for Christ’s sake.” The NIV reads in this way: “I pray that you may be active in sharing your faith, so that you will have a full understanding of every good thing we have in Christ” The Greek en translated “so that” by the NIV implies that the first clause results from the second. The NIV rendering seems better: the “sharing” (koinonia) of your faith. It’s hard to understand if we share our faith based on a fuller understanding of the blessings of Christ, or if we share our faith to get a fuller understanding of the blessing of Christ. Probably both are true. It’s easy to jump immediately to the problems with people and get bossy. But not according to Paul! He took his time and set things up right. He pointed out the good things in Philemon’s life before he brought up this situation with Onesimus. Philemon probably read the letter and felt built up by Paul—rather than feeling bullied or bossed around. He did the right thing with joy—rather than with a grudge. (1:8) “Therefore, though I have enough confidence in Christ to order you to do what is proper.” Paul had apostolic authority, and he could have ordered him to do what was right. The term “confidence” (parrēsia) can be rendered “right” or “authority.” Instead of making a display of authority, Paul makes a persuasive appeal. (1:9) “Yet for love’s sake I rather appeal to you—since I am such a person as Paul, the aged, and now also a prisoner of Christ Jesus.” Paul must have been getting old at this time (“Paul, the aged”). Or, this might refer to older men having authority as an “elder” (presbytēs). (1:10) “I appeal to you for my child Onesimus, whom I have begotten in my imprisonment.” Our justification is an event—not a process. (Phile. 10) Did Paul have an illegitimate son? When we come to Christ, God changes us for the good. (1:12) “I have sent him back to you in person, that is, sending my very heart.” It was illegal to keep a slave. Paul had to send him back. But Paul gives Onesimus incredible dignity, saying that he is his very heart. (1:13) “Whom I wished to keep with me, so that on your behalf he might minister to me in my imprisonment for the gospel.” Paul wanted to keep Onesimus with him. We wonder if Onesimus would’ve begged Paul to stay, rather than going back to face Philemon. However, as a Roman prisoner, Paul had no legal right to keep Onesimus with him. (1:14) “But without your consent I did not want to do anything, so that your goodness would not be, in effect, by compulsion but of your own free will.” Paul urges Philemon to do the right thing for the right reason. (1:15) “For perhaps he was for this reason separated from you for a while, that you would have him back forever.” Paul sees God’s providence behind this whole situation. He sees that perhaps the reason for Onesimus’ escape was so that Paul could lead him to Christ, and send him back as a brother, rather than a slave. God can work through the poor choices that we make. Onesimus ran away from Philemon. Now he is like the Prodigal Son returning and asking for forgiveness after coming to Christ. (1:16) “No longer as a slave, but more than a slave, a beloved brother, especially to me, but how much more to you, both in the flesh and in the Lord.” Paul notes that Onesimus’ change in position should lead to a change in his condition. How could Philemon treat a brother like a slave? (1:17) “If then you regard me a partner, accept him as you would me.” The term “partner” (koinonos) is similar to the word for “fellowship” (koinonia). This is the first imperative of the entire epistle! Slave prices in the Greco-Roman world were directly proportional to the skill and economic value of the slave. A common drudge brought only 500 denarii (a denarius was a laborer’s ordinary daily wage), but skilled teachers, physicians, and actors were purchased for a hundred times as much. Cicero (Q. Rosc. 28) remarks that a talented slave purchased for 3,000 denarii had increased in value 35 times because of the training given him by the comedian Roscius. Seneca (Ep. 27.5) and Martial (1.58.1) both mention 50,000 d. as the price of an accomplished slave. Ellogeo was an accounting term used for settling a debt. Since Jesus paid for our debt, we should pay for others’ debts. (1:20) “Yes, brother, let me benefit from you in the Lord; refresh my heart in Christ.” Paul already said that Philemon was the kind of guy that would “refresh” all of the saints (v.7). Now, Paul is pleading that he would refresh him, too. (1:21) “Having confidence in your obedience, I write to you, since I know that you will do even more than what I say.” This is classic grace teaching! Legalism produces the bare minimum. Grace goes above and beyond (“I know that you will do even more than what I say”). (1:22) “At the same time also prepare me a lodging, for I hope that through your prayers I will be given to you.” Paul expected to be released from prison. (1:23-24) “Epaphras, my fellow prisoner in Christ Jesus, greets you, 24 as do Mark, Aristarchus, Demas, Luke, my fellow workers.” Paul mentions these five workers in Colossians 4:10-14. Rupprecht, A. A. Philemon. In F. E. Gaebelein (Ed. ), The Expositor’s Bible Commentary, Volume 11: Ephesians through Philemon (F. E. Gaebelein, Ed.). Grand Rapids, MI: Zondervan Publishing House. 1981. 453. Wright, N. T. (1986). Colossians and Philemon: an introduction and commentary (Vol. 12, p. 168). Downers Grove, IL: InterVarsity Press. Emphasis mine. Ehrman, Bart D. Forged: Writing in the Name of God: Why the Bible’s Authors Are Not Who We Think They Are. New York: HarperOne, 2011. 93. While this letter is addressed to the “church in your house” (Phile. 2), the letter uses the singular, rather than the plural. For this reason, Rupprecht and Moule argue that this should be understood as a singular, personal letter. Rupprecht, A. A. Philemon. In F. E. Gaebelein (Ed. ), The Expositor’s Bible Commentary, Volume 11: Ephesians through Philemon (F. E. Gaebelein, Ed.) Grand Rapids, MI: Zondervan Publishing House. 1981. 454. Wright, N. T. (1986). Colossians and Philemon: an introduction and commentary (Vol. 12, p. 170). Downers Grove, IL: InterVarsity Press. Rupprecht, A. A. (1981). Philemon. In F. E. Gaebelein (Ed. ), The Expositor’s Bible Commentary: Ephesians through Philemon (Vol. 11, p. 460). Grand Rapids, MI: Zondervan Publishing House. Jefford, C. N. (2012). Reading the Apostolic Fathers: A Student’s Introduction (Second Edition, p. 56). Grand Rapids, MI: Baker Academic. Rupprecht, A. A. (1981). Philemon. In F. E. Gaebelein (Ed. ), The Expositor’s Bible Commentary: Ephesians through Philemon (Vol. 11, p. 458). Grand Rapids, MI: Zondervan Publishing House. Rupprecht, A. A. (1981). Philemon. In F. E. Gaebelein (Ed. ), The Expositor’s Bible Commentary: Ephesians through Philemon (Vol. 11, p. 461). Grand Rapids, MI: Zondervan Publishing House. Rupprecht, A. A. (1981). Philemon. In F. E. Gaebelein (Ed. ), The Expositor’s Bible Commentary: Ephesians through Philemon (Vol. 11, p. 462). Grand Rapids, MI: Zondervan Publishing House. Rupprecht, A. A. (1981). Philemon. In F. E. Gaebelein (Ed. ), The Expositor’s Bible Commentary: Ephesians through Philemon (Vol. 11, p. 463). Grand Rapids, MI: Zondervan Publishing House. Cited in Rupprecht, A. A. (1981). Philemon. In F. E. Gaebelein (Ed. ), The Expositor’s Bible Commentary: Ephesians through Philemon (Vol. 11, p. 462). Grand Rapids, MI: Zondervan Publishing House.